The failed effort to recall Wisconsin Gov. 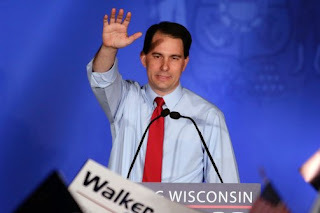 Scott Walker is widely seen as a crisis for the labor movement, and a pivotal moment in the 2012 U.S. presidential-election season. Walker launched a controversial effort to roll back the power of Wisconsin’s public employee unions, and the unions pushed back, aided by strong, grass-roots solidarity from many sectors. This week, the unions lost. Central to Walker’s win was a massive infusion of campaign cash, saturating the Badger state with months of political advertising. His win signals less a loss for the unions than a loss for our democracy in this post-Citizens United era, when elections can be bought with the help of a few billionaires. in Egypt was in full swing, with signs in English and Arabic expressing solidarity with the workers of Wisconsin. The demands for workers rights were powerful and sustained. The momentum surged toward a demand to recall Walker, along with a slew of his Republican allies in the Wisconsin Senate. Then laws tempered the movement’s power. The Wisconsin recall statute required that an elected official be in office for one year before a recall. Likewise, a loophole in the law allowed the target of the recall to raise unlimited individual donations, starting when the recall petitions are filed. Thus, Walker’s campaign started raising funds in November 2011. His opponent, Tom Barrett, the mayor of Milwaukee, was limited to individual donations of up to $10,000, and had less than one month to campaign after winning the Democratic Party primary May 8. Coupled with the impact of the U.S. Supreme Court’s Citizens United decision, the Wisconsin loophole set the stage for grossly lopsided fundraising between Walker and Barrett, and an election battle that was the most expensive in Wisconsin’s history. According to the most recent state campaign-finance filings, Walker’s campaign raised over $30.5 million, more than seven times Barrett’s reported $3.9 million. After adding in super PAC spending, estimates put the recall-election spending at more than $63.5 million. According to Forbes magazine, 14 billionaires made contributions to Walker, only one of whom lives in Wisconsin. Among the 13 out-of-state billionaires was Christy Walton, the widow of John T. Walton, son of Wal-Mart founder Sam Walton. The voters of Wisconsin did return control of the state Senate to the Democratic Party. The new majority will have the power to block the type of controversial legislation that made Walker famous. Meanwhile, three states over in Montana, the Democratic state attorney general, Steve Bullock, won his party’s nomination for governor to run for the seat held by term-limited Democrat Brian Schweitzer. Bullock, as attorney general, has taken on Citizens United by defending the state’s 100-year-old corrupt-practices act, which prohibits the type of campaign donations allowed under Citizens United. The case is now before the U.S. Supreme Court. Wisconsin’s recall is over, but the fight for democracy starts with one person, one vote, not 1 percent, one vote. Amy Goodman is the host of “Democracy Now!,” a daily international TV/radio news hour airing on more than 1,000 stations in North America. She is the author of “Breaking the Sound Barrier,” recently released in paperback and now a New York Times best-seller.